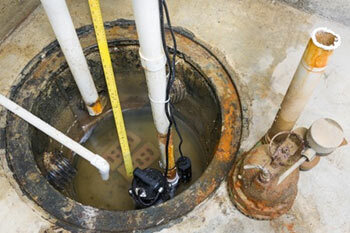 Sump Pump and Sewage Pump: What's the Difference? Troudt Plumbing, Greeley plumbers with decades of experience,installs both sump pumps and sewage pumps. Over the years we’ve heard some customer confusion about the two. Here’s the difference: A sump pump is a small pump is located in your basement, usually installed in the lowest area of the floor or crawlspace, and installed in a specially constructed sump pit. This pump works to collect water than can build up in the soil surrounding the building’s foundation, or water that sits under the building. Rain, snow melt, or heavy downpours from gutters can oversaturate the soil. This ground water flows into the sump pit, either through drains, or by migrating through the soil. The sump pump turns on when the water in the pit reaches a certain level, and the water is removed by being pumped through a discharge pipe. This is clear water, generally cold, and with no sewage solids. Without a properly functioning sump pump, this ground water can flood the basement, causing water damage, and possible mold and mildew problems. Is Your Pump Working Properly? You can’t really trigger your sump pump, but you can probably hear it turn on after rainstorms or heavy snow melt have saturated your ground soil. However, you can test if it’s working by emptying a bucket of water into the sump pit. A working pump will immediately eject the water. If the water just sits there, you need to call us, your plumbing service in Greeley, CO, for help -- especially for commercial or industrial buildings where a flooded basement could cause major problems and expenses. A sewage ejector pump is installed in the floor of your basement to collect the discharged water from sinks, floor drains and washing machines. Known as “gray water” because it can contain solids and contaminants, this water is pumped into a sanitary sewer line. And if you install a basement bathroom, you will absolutely need a sewage pump. Why? Because basement plumbing pipes run in between the joist of the ceiling in most cases, connecting with other pipes in the home. But basement, sink, shower and toilet lines are installed below the level of those pipes, and don’t have the boost that gravity provides for the plumbing in the rest of the home. A sewer pump ensures that you won’t have a sewage backup problem in your basement bathroom. Without a properly working sewer pump, you risk flooding your basement with water that may well contain raw sewage or high microbe counts and dirt of all sorts. This means that your basement will not only suffer water damage, but will need sanitizing, as well. Depending on the age of your sump or sewage pump, the condition of the pipes and other factors, a pump may need to be replaced rather than repaired. Proper maintenance can extend life of the pump. Call us today for an inspection, repair or replacement of your sump or sewage ejector pump.